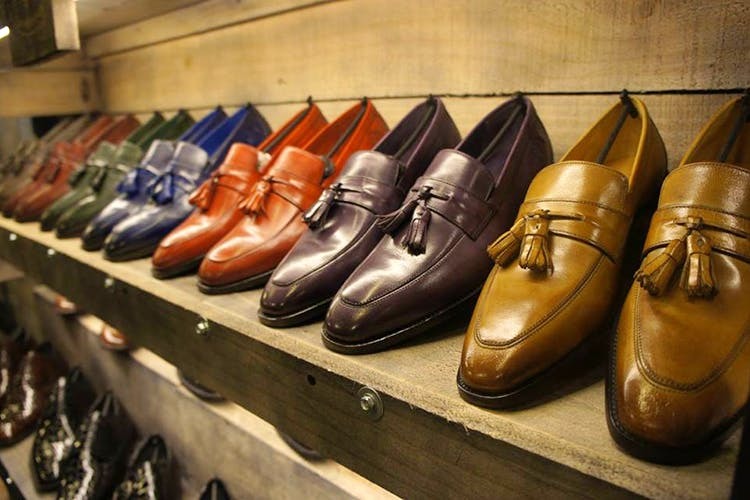 If you fancy leather shoes and apparel, head to Hoofs & Hides on Residency Road to stock up on all kinds of leather wear and accessories. Plus, they do it on a budget! A faint smell of leather welcomes you when you step into Hoofs & Hides on Residency Road. A quick glance at the small store is enough to gauge that it is well-stocked and has an inventory of almost all kinds of merch ranging from footwear to accessories. We are told that the store specialises in shoes, bags, and leather jackets, with the store’s inventory of shoes and bags covering almost every inch of the store space. Sharp-looking formal shoes, comfy loafers, and brunch-ready sandals for men made from calf as well as goat and sheep leather sit alongside pretty-looking slip-on trainers in blue, yellow, silver, and tan for women. They are made from goat leather we are told. We spotted Oxfords, monkstraps, Chelsea boots, and round tips amongst men’s footwear. These start at INR 1,000 for both men and women. In the bags, jacket, and accessories section, the store’s interesting collection captures our attention. The writer likes that the store recognises that guys need bags too. Their collection of messenger bags and backpacks and satchels are perfect for boardrooms and getting your hipster mode on. The entire collection is after all indie. Duffel bags, travel bags, and laptop backpacks and sleeves are available too along with bi-fold and tri-fold (yaaaas!) wallets, and belts for men. For the ladies, there are rectangular cute wallets in yellow, blue, and red as well as long purses and sling purses. Unisex passport holders are also part of the collection. Accessories start at INR 500 while bags start at INR 1,500. Ladies handbag are available in leather and non-leather and come in designs such as shoulder, tote, and day bags. Jackets are in a limited collection, but that’s probably because they are made to order. The store lets you customise your own jacket and lets you select your own design from their catalogue or if you bring your own design. Biker, bomber, racer — you name it and consider it done.